It was just a matter of time before the small-batch/local/craft product snobbery that ruined contemporary beer would spread to marijuana … and it's not even fully legal yet! 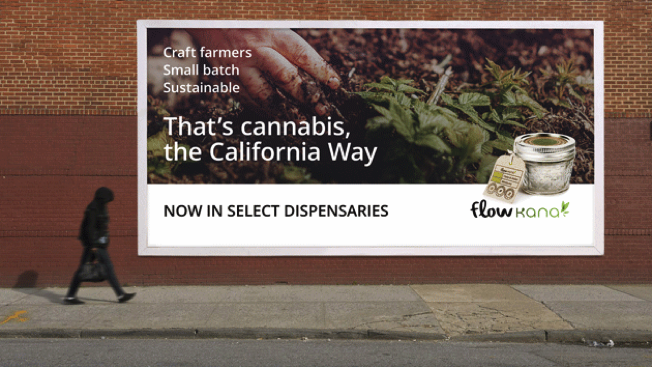 That hasn't stopped Flow Kana, a group of Northern California organic pot farmers, from putting together a multichannel marketing blitz (the first of its kind for marijuana) to promote its "brand." Flow Kana's campaign will make landfall in San Francisco, Oakland and Berkeley on 4/20, naturally, and pits the salt-of-the-earth pot farmers of California's Emerald Triangle region against dastardly corporate farms. And while marketing itself as "artisanal" might be the most obnoxious way possible to express its difference, the alternative is irrelevance. Marijuana is the backbone of the Triangle's economy. It has made such significant business that growers even opposed legalization, because it would open them up to outside competition. An execution like what you see above—just one example of what will be diffused in a couple of days—should come as no surprise. We understand Flow Kana's motivation, but we also watched the entire run of Deadwood, and right now they're Al Swearengen. Their only hope is that the tide doesn't rise against pretentious West Coast "conscious consumerism" before they have the chance to make the impact they want.